Ready to kiss 2018 goodbye? 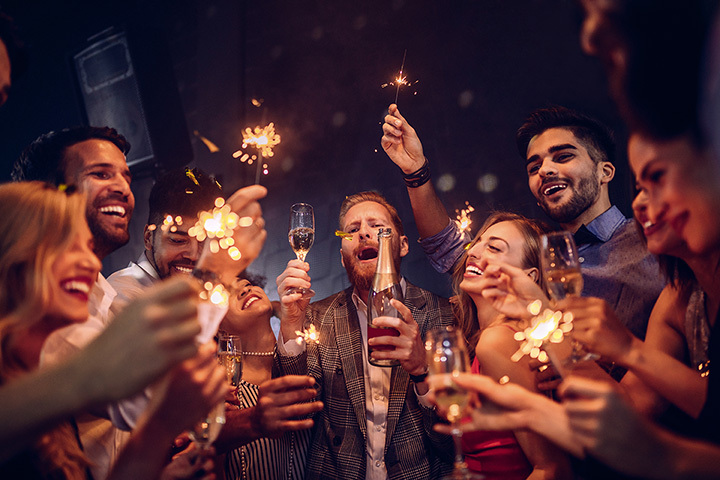 After a long year, you deserve to party in style! North Carolina is THE place to be for New Year’s Eve, with tons of parties, dinners, and events to choose from. Start the new year off right at one of these 10 best New Year’s Eve celebrations in North Carolina. Skip the ball drop and head to Biltmore Park for Thirsty Monk’s annual keg drop. This golden keg towers two stories as it slowly descends into the new year. This event is free and open to the public. By far one of the most creative takes on traditional New Year’s Eve parties, this shindig at 26 Acres Brewing is equal parts glam and gruff. This mega taproom is transforming into a party haven, complete with dancing, DJs, s’mores bar, keg drop, and even ax throwing. You won’t find another NYE party quite like this anywhere else. This free event is the biggest in Matthews, but the price isn’t the only thing it has going for it. They’ve got plenty of snacks to fuel your evening, along with their champagne glasses available for sale. It also helps that they have the biggest selection of wine around. A masquerade and murder mystery theater mashup, this event puts you in the center of the evening’s entertainment. Step inside the super swanky WXYZ bar at Aloft and start playing detective. This party WILL sell out, so make sure you get your tickets early. This fan-favorite craft brewery is bringing out all the shimmer and shine a good NYE party deserves. Enjoy a hand-picked selection of North Carolina’s best beers and ciders, along with sparkling wine and soda. Tickets are $35 and include two complimentary drinks, champagne toast, party apps, and glitzy accessories to make your entire evening sparkle. It’s just not New Year’s Eve without a Gatsby-themed party, and this is THE place to be on December 31! Throw it back almost a century as you take advantage of an open bar, unlimited hors d’oeuvres, dinner buffet, balloon drop, and music. They’re limiting tickets so everyone can have a good time, so grab your spot early. Beer lovers won’t want to party anywhere else! This fun-packed evening is chock full of unlimited beer and wine, food from KA Kitchen and Lounge, music provided by Southern Style Band, and even a souvenir glass and new beer releases! Grab your ticket before Dec 26 while they’re still just $55 (they go up to $65) because they won’t be sold at the door. Rustic and beautiful, this laid-back soiree is a unique take on a classic NYE event. DJ Victor Huaman is in charge of your night’s entertainment while you indulge on unlimited hors d'oeuvres, beer and wine, and a dance floor that’s calling your name. They’ll be airing the NYC ball drop live so you don’t miss the stroke of midnight. There’s never a bad time to visit this retro 60s/70s inspired bar and restaurant, but New Year’s Eve ups the ante BIG time. DJ Sami Automatic will be taking control as guests savor specialty dishes, craft cocktails, and a stunning ambiance. Hosted by Ebony Brite Publishing, this music-filled evening will leave you inspired. Featuring hors d’oeuvres and drinks, this melodic journey includes some of the best genres in music, including soul, funk, jazz, classic R&B, pop, and beach, to name a few. Tickets are $30 for the whole show, and you’ll want to get them before they sell out.